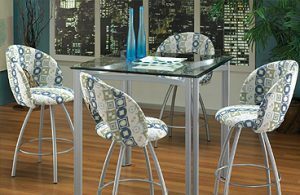 Barstools make it easy for you to stand up or sit down. This is great for parties, where guests alternate between sitting down and getting up to mingle. It’s also helpful when you’re playing stand-up games that go in turns, like darts or pool. And most importantly, when you’re watching a sports game it’s easier to jump out of your barstool and cheer for the big plays. Barstools can make you more alert – or they can help you relax. 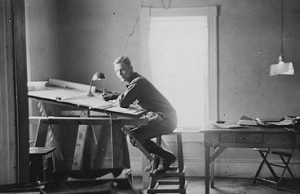 There’s a reason that architects and artists have traditionally worked at a drawing board while perched on a stool. A plain stool without a back or arms can improve your posture and keep you awake, alert and focused. But when you add the back and arms, the basic barstool turns into a comfortable, relaxing seat that’s perfect for kicking back with a drink. A parsons stool with just a back offers the perfect in-between. Barstools swivel better than chairs. In places like parties or bars, it’s great to swivel so you can always be in on the action. When you sit in a barstool, your feet are usually on a footrest, directly under your body. This foot position gives you leverage to swivel with ease. With swivel chairs, your feet are positioned in front of you. This puts a much greater strain on your abs and knees. It’s less comfortable – and it reminds you of sitting in your office desk chair! Now you know a few of the reasons we’re crazy about barstools. 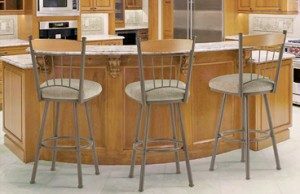 Click here to see one of our favorite swivel barstools with a back and arms – perfect for just about any scenario!